An escaped convict and his girlfriend take a couple on their way home from a camping trip hostage in their vehicle. When the group comes across a deadly parasite that turns its victims into ravenous zombie-like creatures, they must take shelter in a gas station and find a way to work together so they can survive. If we've learned anything from watching horror movies, it's that if you see a strange substance and don't know what it is...don't bloody touch it! "Splinter" is directed by Toby Wilkins and is his first feature-length movie. Wilkins has also been a director on many television series such as "Devil's Trade" and "Teen Wolf." The screenplay is written by Ian Shorr and Kai Berry. The story revolves around Seth (Paulo Costanzo) and Polly (Jill Wagner), a couple on a romantic camping trip, though Seth is far more of an intellectual than outdoorsman. On the way back from their excursion, they are carjacked by an ex-con named Dennis (Shea Whigham) and his drug-addict girlfriend Lacey (Rachel Kerbs). Forced to drive at gunpoint, the group gets a flat tire when they run over an animal that appears to be infected by some weird parasite. The four of them make their way to a local gas station, but this parasite has already contaminated the attendant and has turned him into some sort of monster. Now, barricaded inside the gas station, the group must hole up and work together to survive despite being in a criminal/hostage situation. 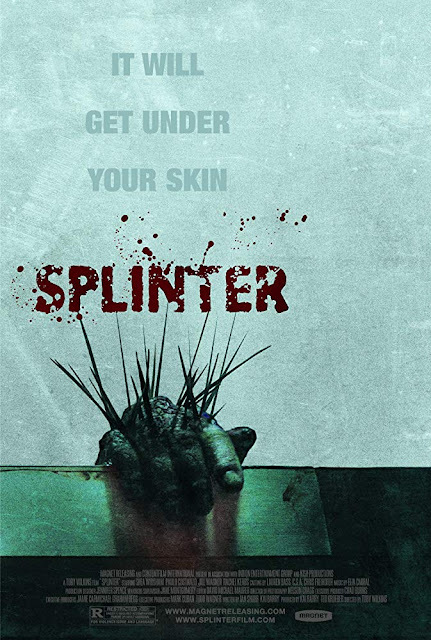 Despite being a low budget horror thriller, "Splinter" manages to be an effective flick. Sure, it doesn't have the most original concept and can be considered a bit derivative, but so few horror movies do anything different these days, and there's only so many things movies can do at all. For us, there's enough good stuff going on here that we can ignore its familiar story. Two of the best things about "Splinter" are the makeup work and its visual effects, which are great looking for a film with so few monetary resources. The body horror elements offer a sufficiently unsettling experience. There is quite a bit of tension and excitement as this small band of people does what it can to survive against this unknown, ever-evolving, grotesque, spindly parasite. We constantly root for them to figure out how to fight it and hope they can do what they have to do to survive the night, even if it means sacrificing themselves. We can't say the acting is exceptional, but it's better than what we typically exposed to from low budget horror cinema. If it weren't for some weird, choppy editing and odd choices in its cinematography that became a huge detractor due to its distracting nature, we probably would have given "Splinter" a higher score. We found "Splinter" to be a successful horror film overall. 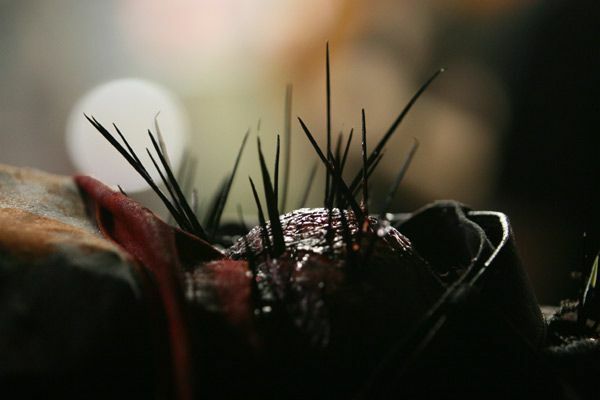 It brings the non-alien parasite and zombie subgenres together into one fun, grotesque ride.